The National Bureau of Economic Research has declared the Great Recession over. But the struggles continue. According to the group of university economists responsible for dating the official beginnings and ends of business cycles, the contraction that started in December 2007 officially stopped 18 months later in June 2009, marking the longest recession since the 43-month Great Depression. In several ways, this downturn has been more profound – and could be tougher to bounce back from – than other recent recessions. According to analysts surveyed by Bloomberg financial news, earnings for companies in the Standard & Poor’s 500 Index should be back to pre-crash record levels by mid-2011. How companies are profiting while the economy remains weak points out a distinction in this recovery. Indeed, a recent poll by CNN/Opinion Research Corp. showed that 74% of Americans believe the U.S. economy is still in recession. But because they operate in a global economy, many U.S. businesses are growing both profits and revenue. In the second quarter, more than half of the earnings reported by the country’s 500 largest corporations came from outside of the United States, Bob notes. That helps explain a disconnect between Americans’ view of the economy and the outlook they could have as investors. To read more about that, please click here. 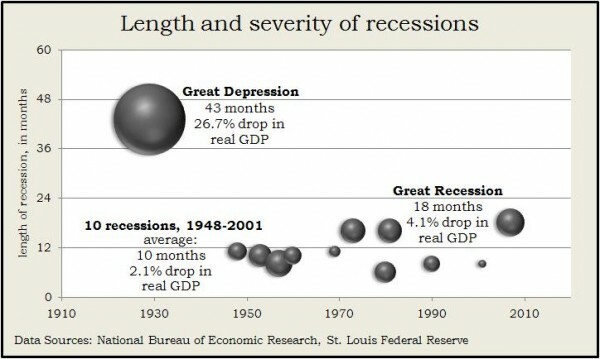 As for the economy, here are some comparisons on how this latest recession ranks. 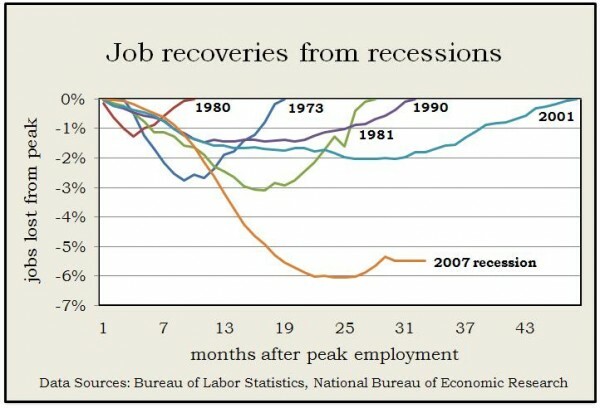 Then – Of the five previous recessions dating back to 1973, the 2001 downturn took the longest to recover lost jobs. That recession itself lasted eight months, but employers needed 48 months to make up the 2% they cut from nation’s payrolls. Now – As of this past August, 32 months after 2007 payrolls peaked, employment was still down 5.5% – or 7.6 million jobs short of recovery. Then – In the six previous recessions, the Gross Domestic Product – the broadest measure of economic growth – recovered in five quarters, on average. The most grudging of those recoveries was eight quarters in the 1973 recession, when at one point GDP was 3.2% under its pre-recession peak. Now – Through mid-2010, inflation-adjusted GDP was still 1.3% below where it was 10 quarters earlier. 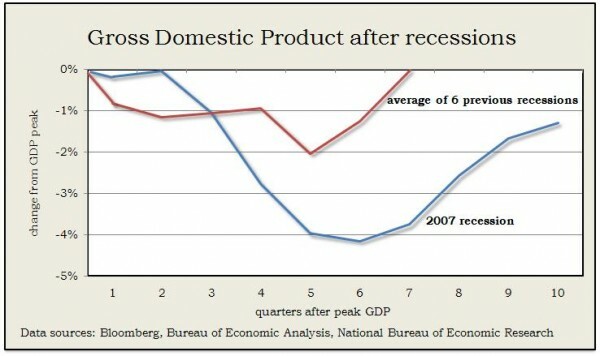 In mid-2009, when the recession officially ended, GDP bottomed out at 4.1% below the peak. 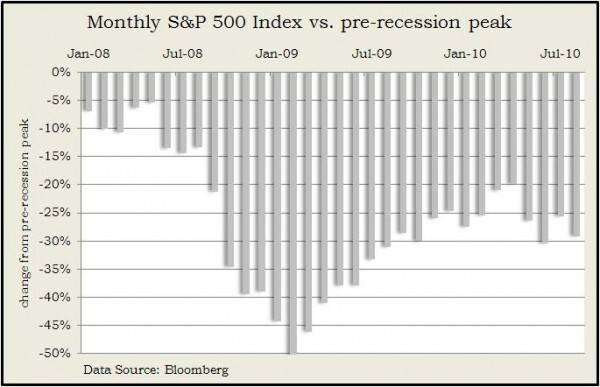 Then – In four of the previous six recessions, the monthly Standard & Poor’s stock index recovered from its pre-recession high before the recession was over. The worst case was in the 1973-1975 recession, when it took 69 months – almost 7 years – for the S&P index to regain its losses. At its deepest, the index was down 41% during that downturn. Now – The index dropped by more than 50% from where it was just before the 2007 contraction. Through August, it was still 29% short of recovering. Now – The 18-month downturn that began in 2007 compares to a 10-month average for the 10 previous recessions since World War II, according to data from the National Bureau of Economic Research. 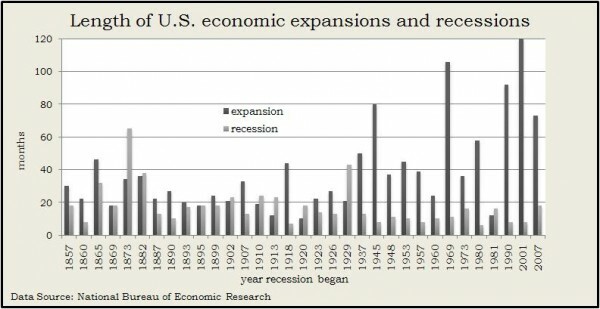 Then – But of 32 U.S. recessions since 1854, seven have been longer than 18 months. One of those, of course, was the Great Depression. The granddaddy of all spanned 65 months – lasting from 1873 to 1879.